Our canine friends require rich protein to stay fit and healthy. Our lamb & lentils grain-free recipe has 82% of proteins coming from real meat like lamb, turkey and chicken to help dogs build strong muscles and bounce back from a day of play. And with our low carbohydrate ingredients and advanced probiotics, you’ll know your best friend is getting the nutrition they deserve. Compare any Nulo MedalSeries™ recipe against the brand you’re currently feeding your athlete. AVAILABLE IN 4.5 LB, 11 LB AND 24 LB BAGS. 82% of protein from animal sources. 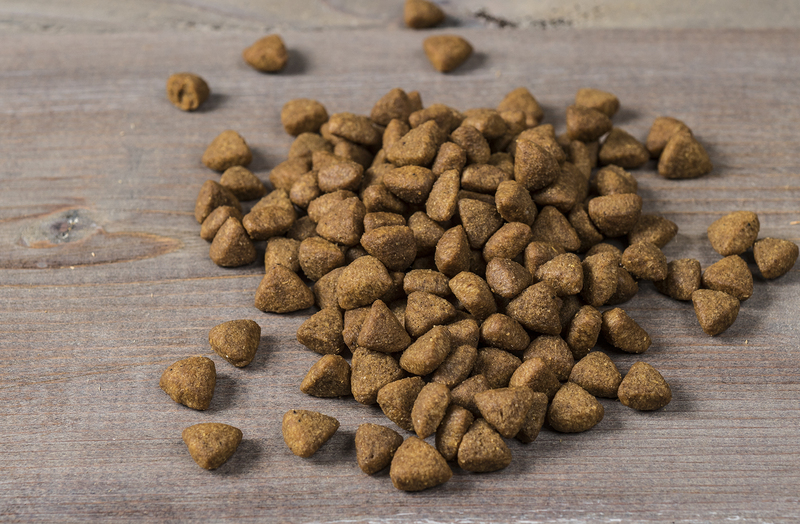 The combination of Zinc and Iron from real lamb helps support your dog’s overall immune health. GanedenBC³⁰ probiotic supports your pet’s digestive & immune health. Our top three ingredients are animal protein sources. Compare to the brand you’re feeding your athlete! Antioxidants, such as vitamin C and vitamin E, help support overall cellular health. A balanced amount of Omega-3 and Omega-6 fatty acids nourish your pet’s skin and help promote a beautiful shiny coat. Contains the botanicals sweet fennel, dandelion, and chamomile. Lamb, Turkey Meal, Chicken Meal, Whole Peas, Sweet Potato, Chicken Fat (preserved with Mixed Tocopherols & Citric Acid), Lentils, Menhaden Fish Meal, Pea Fiber, Natural Lamb Flavor, Yeast Culture, Dried Chicory Root, Potassium Chloride, Dried Apples, Dried Blueberries, Dried Carrots, Dried Tomatoes, Calcium Carbonate, Salmon Oil, Salt, Sweet Fennel, Dandelion, Chamomile, Zinc Proteinate, Vitamin E Supplement, L-Ascorbyl-2-Polyphosphate (source of Vitamin C), Iron Proteinate, Niacin, Copper Proteinate, Choline Chloride, Thiamine Mononitrate (source of Vitamin B1), Calcium Pantothenate, Vitamin A Supplement, Manganous Oxide, Pyridoxine Hydrochloride (source of Vitamin B6), Sodium Selenite, Riboflavin, Vitamin D3 Supplement, Biotin, Dried Bacillus coagulans Fermentation Product, Vitamin B12 Supplement, Calcium Iodate, Folic Acid, Rosemary Extract. MedalSeries Adult Lamb & Lentils Recipe is formulated to meet the nutritional levels established by the AAFCO Dog Food Nutrient Profiles for maintenance. Contains a source of viable naturally occurring microorganisms. Every dog is a little different, so the ideal feeding amount may vary with age, size and activity level. Please use the information below as a starting guideline only and adjust as required. Ask your veterinarian if you’re unsure. Always provide plenty of clean, fresh water and hugs. 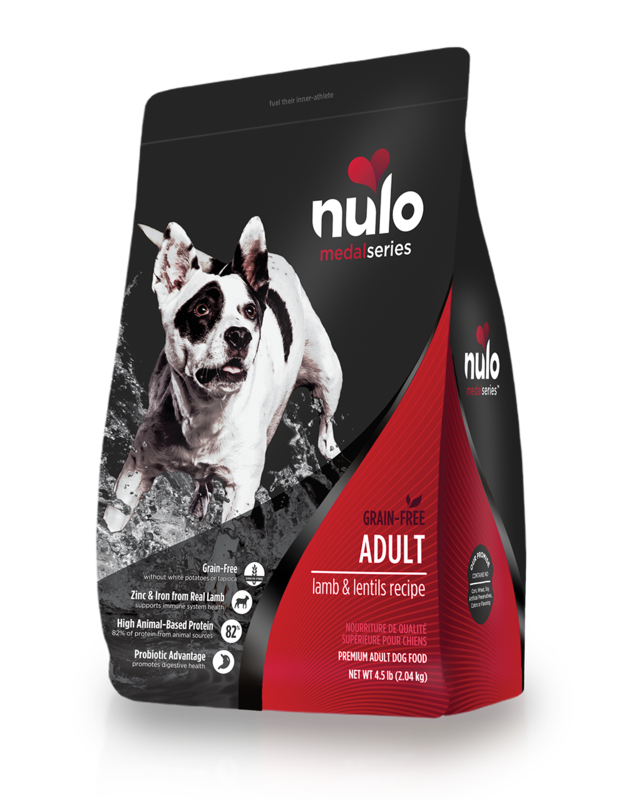 This formula provides 100% complete and balanced nutrition for the maintenance of adult dogs. This formula is not intended as the sole diet for growing puppies, pregnant or lactating dogs – as they have special nutritional needs that require a different balance of protein, calories and other nutrients. 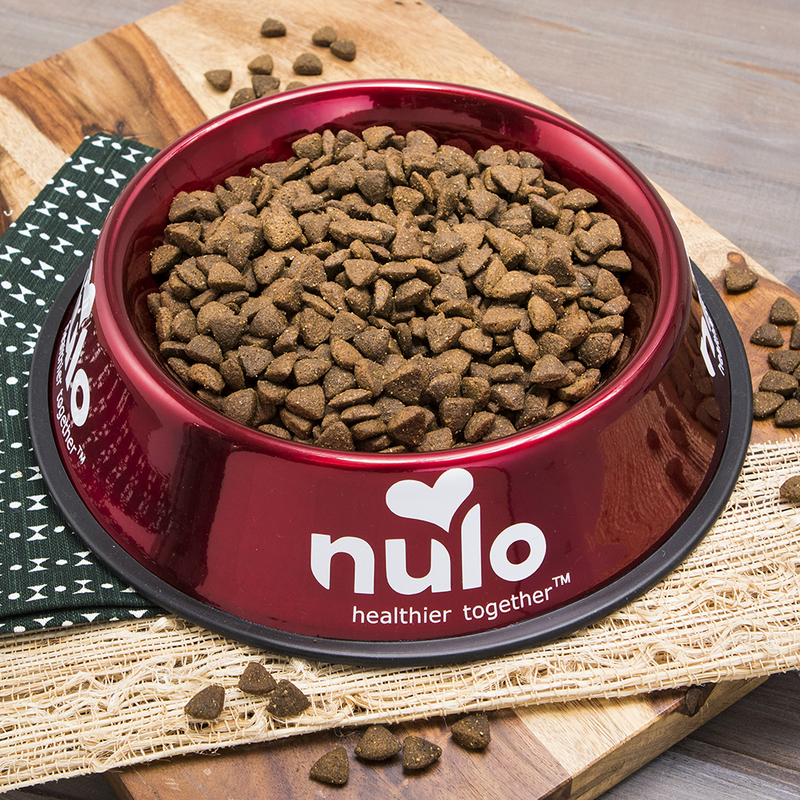 If you or your dog are not completely satisfied with your Nulo purchase, simply bring the unused portion, packaging and receipt back to the place of purchase for a full refund.